This extended three bedroom property is situated in a tree lined road within walking distance to Walton town centre. The accommodation comprises of three bedrooms, living room, re-fitted kitchen/dining room and a conservatory. Other notable features include driveway parking to the front and rear, 125' rear garden, a re-fitted modern bathroom suite, UPVC double glazing and gas central heating. The property also benefits from being 1.3 miles to both Walton-on-Thames and Hersham mainline railway stations and within the catchment area of some of the most popular local schools. Wood flooring, under stairs storage cupboard and radiator. Stairs to first floor landing and door to living room. Front aspect UPVC double glazed window. 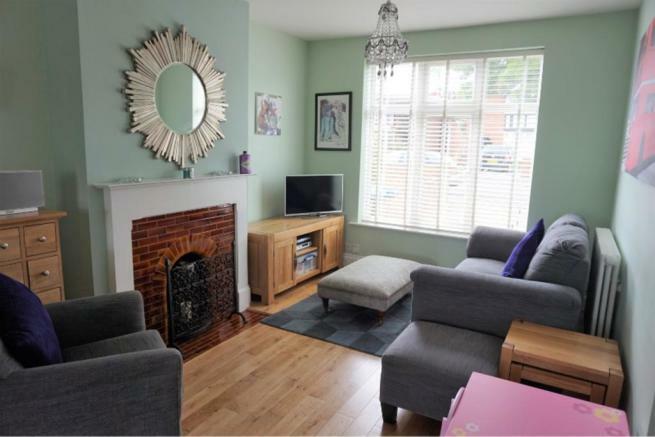 Feature fireplace, wood flooring, radiator and opening to kitchen/dining room. Range of eye and base level units with single sink drainer. Integrated electric hob and oven with extractor over. Space and plumbing for washing machine and tumble dryer. Integrated fridge freezer. Wood flooring. Opening to conservatory. Of brick construction with rear aspect UPVC double glazed windows and french doors to rear garden. Radiator and wood flooring. Doors to all bedrooms and bathroom. Access to loft via hatch with loft ladder. Front aspect UPVC double glazed window. Feature fireplace and radiator. Rear aspect UPVC double glazed window. Feature fireplace and radiator. Rear aspect UPVC opaque double glazed window. Panel enclosed bath with shower over and shower screen. Low level WC and wash hand basin inset into vanity unit. Fully tiled walls, heated towel rail, extractor fan and tiled flooring. Measuring approximately 125'. Mainly laid to lawn and enclosed by wood panel fencing and a number of mature shrubs. There is a patio area which is ideal for entertaining. There is also secure gated rear access to the garden and a number of storage sheds. Driveway parking to the front of the property for numerous vehicles. There is also further parking available to the rear of the property at the end of the garden. Disclaimer - Property reference 535778-1. The information displayed about this property comprises a property advertisement. Rightmove.co.uk makes no warranty as to the accuracy or completeness of the advertisement or any linked or associated information, and Rightmove has no control over the content. This property advertisement does not constitute property particulars. The information is provided and maintained by Purplebricks, covering London. Please contact the selling agent or developer directly to obtain any information which may be available under the terms of The Energy Performance of Buildings (Certificates and Inspections) (England and Wales) Regulations 2007 or the Home Report if in relation to a residential property in Scotland.